Long before Steve Jobs became the CEO of Apple and one of the most recognizable figures on the planet, he took a unconventional route to find himself -- a spiritual journey that influenced every step of an unconventional career. Jobs, who died Wednesday at the age of 56 of pancreatic cancer, was the biological child of two unmarried academics who only consented to signing the papers if the adoptive parents sent him to college. His adoptive parents sent a young Jobs off to Reed College, an expensive liberal arts school in Oregon, but he dropped out and went to India in 1973 in search of enlightenment. Jobs and his college friend Daniel Kottke, who later worked for him at Apple, visited Neem Karoli Baba at his Kainchi Ashram. He returned home to California a Buddhist, complete with a shaved head and traditional Indian clothing and a philosophy that may have shaped much of his corporate values. Later, he was often seen walking barefoot in his trademark blue jeans around the office and reportedly often said that those around him didn't fully understand his way of thinking. "I wouldn't say Steve Jobs was a practicing Buddhist," said Robert Thurman, a professor of Buddhist studies at Columbia University, who met Jobs and his "Tibetan buddies" in the 1980s in San Francisco. "But he was just as creative and generous and went outside the box in the way that he looked to Eastern mental discipline and the Zen vision, which is a compelling one." "He was a real explorer and very much to be mourned -- and too young at 56," said Thurman. "We will remember the design simplicity of his products. That simplicity is a Zen idea." Thurman met Jobs in San Francisco in the 1980s with Grateful Dead drummer Mickey Hart and actor Richard Gere. The discussion was about Tibet. "It was before the Dalai Lama, and he was very sympathetic and had advice for the Tibetans," he said. "But he was into his own thing and didn't become a major player." Jobs used Dalai Lama in one of Apple's most famous ad campaigns: "Think Different." "He put them up all over Hong Kong," Thurman said of the computer ads. "But then the Chinese communists squawked very violently and as my son says, 'He had to think again.'" Zen Buddhist monk Kobun Chino Otogawa married Jobs and his now widow, Laurene Powell Jobs, in 1991. "We did not pay too much attention to his personal life, but from his past interviews and speeches, we could see the embedded influences by the Buddhism," said Gary Li, secretary of the Buddhist Association of the United States. Jobs could have just as easily taken his philosophy from the hippie movement of the 1960s. The Whole Earth Catalog was his bible, with founder Stewart Brand's cry, "We are as gods." The catalogue offered an integrated and complex world view with a leftist political calling. Jobs later adopted the catalog's mantra: "Stay hungry. Stay foolish." Buddhism a Wake-Up Call for Steve Jobs? The catalog also delved into spirituality. In one 1974 article, author Rick Fields wrote that Buddhism is "a tool, like an alarm-clock for waking up." That may have been the case for Jobs. He said in his now-famous 2005 Commencement speech at Stanford that he lived each day as if it were his last, admonishing graduates not to "live someone else's life." "Don't be trapped by dogma -- which is living with the results of other people's thinking," Jobs said. "Don't let the noise of other's opinions drown out your own inner voice." In that speech he told students to follow their passions, recounting the time after he dropped out but continued to audit non-credit classes like calligraphy. The elegant typefaces -- serif and sans serif -- were later introduced for the first time in the Macintosh. "I didn't have a dorm room, so I slept on the floor in friends' rooms, I returned coke bottles for the 5 cent deposits to buy food with, and I would walk the seven miles across town every Sunday night to get one good meal a week at the Hare Krishna temple," he said. "I loved it." Jobs was also influenced by Richard Baker, who was head of the Zen Center in San Francisco from 1971 until 1984, when Baker resigned after a scandalous affair with a wife of one of the center's benefactors. But Baker helped the center grow to one of the most successful in the United States. He was receptive to Baker's message of change, "helping the environment and empowering the individual." Jobs admitted to experimenting with the hallucinogenic drug LSD, which he has said was "one of the two or three most important things" in his life. In an unauthorized biography by Alan Deutschman, a college friend said that Jobs had even been a lover of folk singer Joan Baez, who was 41 at the time, and the attraction was largely because she had also been intimate with another '60s icon, Bob Dylan. He was a fan of the Beatles, who also embraced spirituality and made a similar pilgrimage to India. Jobs told television's "60 Minutes" he modeled his own business after the rock group. "They were four guys that kept each other's negative tendencies in check; they balanced each other," he said. "And the total was greater than the sum of the parts. Great things in business are not done by one person, they are done by a team of people." Jobs said that "focus and simplicity" were the foundation of Apple's ethic. "Simple can be harder than complex: You have to work hard to get your thinking clean to make it simple," he told Businessweek in 1998. "But it's worth it in the end because once you get there, you can move mountains." Even the minimalist design of his products -- from the first Macintosh to the sleek iPad have a "aesthetic simplicity and keenness of line" that smacks of Japanese Zen, according to Columbia's Thurman. Former Pepsico President John Sculley, who eventually fired Jobs, said walking into Jobs' apartment had the same design feel. "I remember going into Steve's house, and he had almost no furniture in it," Sculley said in a 2010 interview with Businessweek. "He just had a picture of Einstein, whom he admired greatly, and he had a Tiffany lamp and a chair and a bed. He just didn't believe in having lots of things around, but he was incredibly careful in what he selected." 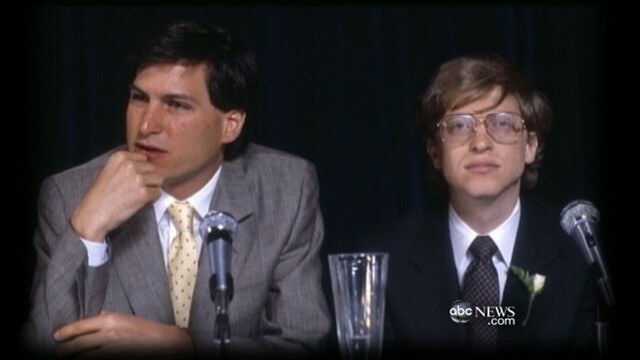 Jobs reportedly convinced Sculley to work for Apple when he asked, "Do you want to spend the rest of your life selling sugared water, or do you want a chance to change the world?" Thurman contends Jobs' greatest success was not necessarily financial. "It was his initial role in making the PC available to individuals to give them computer power," said Thurman. "He was democratizing computer power. It was his own inspiration of things and not accepting the status quo and breaking through the power of the people." Though Jobs may not have been a devout practitioner of Buddhism, his personal and corporate vision certainly struck the same tone -- "wisdom and compassion," he said. "Zen vision is that human beings can understand reality if they focus their mind on it and develop wisdom," said Thurman. "When you do, you have the greater capacity to arrange the nature of things and to help people." But the irony of Jobs' spirituality was that as much as it reflected the most beautiful aspects of the products he made, those very "machines" have in some ways enslaved a generation of users, according to John Lardas Modern, a professor of religious studies at Franklin and Marshall College in Pennsylvania. Jobs made computers and hand held devices that have allowed people to become "disembodied" on a certain level -- "to escape and transcend the mundane reality of bodily existence," according to Modern. Such spirituality begs for freedom from the trappings of tradition, he said, but it has a down side. "These machines are amazing," said Modern. "For the last 12 hours, I have been seeing people on Facebook and Twitter in praise of how the devices he made allow ease and convenience and empowerment." "I love my iPad, precisely because it feels like an extension of my mind and I can't live without it," said Modern. "The irony is, these products ground us in a chair behind a desk, behind a computer and in a sense they have pushed us inward -- and you don't have physical connections with others." "It cuts both ways," he said. +After Jobs, What Now for Apple?